In 1547, Prince Vicino Orsini commissioned work to begin on a park filled with twenty-four natural bedrock-sculpted art pieces. Most of these are based on grotesque figures of mythological origin that were important during this time period. The park, currently considered by many to be the first theme park, was called Bosco Sacro. 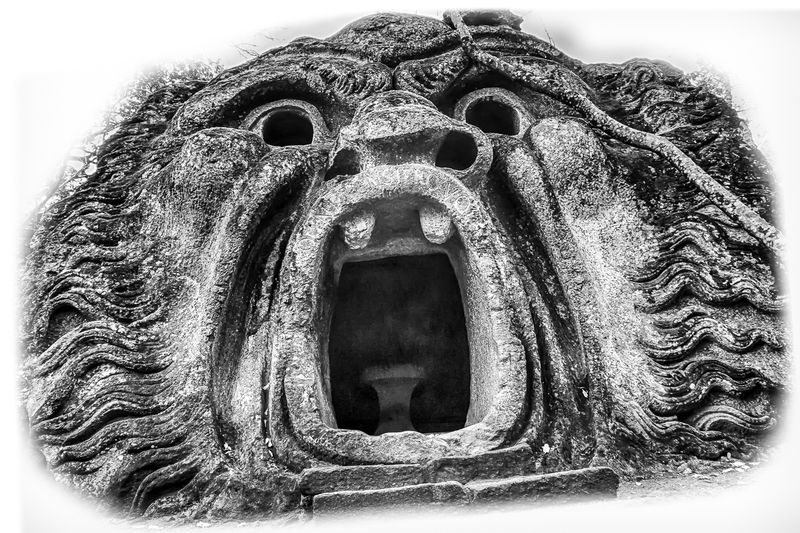 It is known today as “Monster Park”, located in Bomarzo, Italy. It eventually became dedicated to the loving memory of his wife, Giulia Farnese, who died in 1560 before the park was completed. The Prince commissioned Pirro Ligorio, well-known at the time for finishing St. Peter’s Basilica after Michelangelo died, to create these sculptures. Legend has it that the heart-broken Prince had lost his sanity soon after his wife’s death, and changed the park’s creation to reflect his state of mind. This may have been his way of conveying his sense of anguish, or the confusion and dizziness of this experience within his head. Inspired by Prince Orsini’s artistic vision, I have attempted to construct a modern-day adaptation of a dreamland journey through the visions of his tragic insanity. The distorted pieces contained within this series are composites of many of the original twenty four Ligorio works. The story of the insanity begins with our hero, the proud figure of a man, Hercules, dreaming and reliving the loss of his beloved wife, Ceres. During the course of his Underworld visions, the hero barehanded slaughters Cacus, a fire-breathing giant and the son of Vulcan. He must also avoid the echo and terrorizing scream of Orcus, the demon prince and lord of the undead. There are encounters with Jupiter and Neptune. The fortified elephant of Hannibal is found carrying the unconscious body of a legionnaire. He passes Cerberus, the three headed dog, guardian of hell; and a winged Dragon. Our hero’s journey into insanity ends with the final vision of Proteus swallowing the tortured eyes of his wife.